It is almost ninety years since Audrey Hepburn was born. 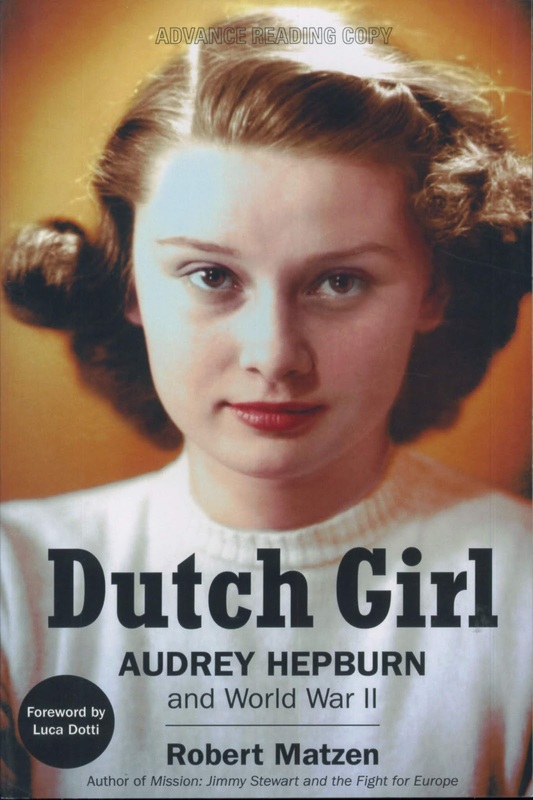 Whatever perception you have of her will be utterly changed from what previous books tell thanks to Dutch Girl: Audrey Hepburn and World War II, third in Robert Matzen’s “Hollywood in World War II” trilogy. Here is biography gone past the rote word to become an all-true suspense thriller featuring this most beloved of film stars. Let me put this way: Audrey Hepburn knew not half so much danger in any film as she did growing up in Nazi-occupied Holland, nor did life-risk on screen approach gamble she took during adolescence to assist resistance efforts. Wait Until Dark must have seemed to Hepburn like Christmas pantomime compared with what she had been through. Did you know both her parents sided with the Nazis? I had no inkling of it, Matzen dredge through Euro archives, secret diaries, now-it-can-be-told interviews with family members a matter of one startling revelation after another. Better strap in for Dutch Girl --- it’s wartime espionage with Audrey Hepburn’s survival anything but a sure thing. She’d go without food for three days at a time (German starvation strategy upon the Dutch) and still help with ongoing rescue of wounded Allied soldiers. There are photographs, documents, and mementos in Dutch Girl, supplied by Audrey Hepburn’s family, that have never been seen before. You actually wonder if Audrey will make it through such harrowing ordeal, despite evidence of beloved film roles she later did, and that’s a best indicator of nail-bite Matzen maintains through his narrative. I never realized how close we came to not having an Audrey Hepburn. Dutch Girl will be released in hardcover on April 15 and available at Barnes & Noble and other booksellers nationwide. The hardcover, ebook, and audio book can be pre-ordered now at Amazon.com. Hepburn's film image was always the delicate beauty; innocent young Sabrina facing a big scary world. Wondering if Hollywood -- and Hepburn herself -- deliberately concealed or at least downplayed her wartime heroics and the fearsome realities she faced lest it undercut that image. Even her fabled litheness takes on a different meaning when you know she nearly starved to death in her youth. Did the book get into this? Recalling how Harold Lloyd successfully concealed that much of one hand had been blown off by a prop bomb. Walter Kerr opined that Lloyd was afraid his stunting would look too dangerous and less funny. Screen idols who don't live up to their PR are hardly news, but one wonders how many deliberately minimized or concealed real-life heroics, achievements, or endurance in service of screen personas.